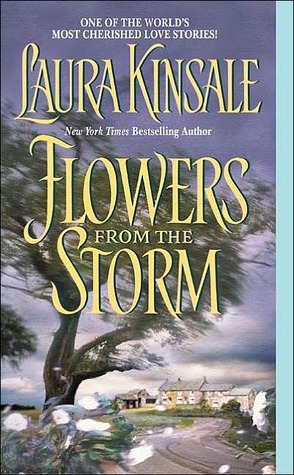 If you ever Google something like “romance canon” or “best romance novels”, Flowers in the Storm usually sends up on one of those lists. A classic of the genre, it was actually one of the first picks of the new and fast growing “Old School Romance Readers” Facebook group (of which of course I’m a member). 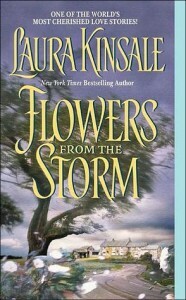 Published in 1992, the book is firmly in the era where most romances included wilting heroines and grumpy heroes who finally found love despite loads of miscommunication. Some of the books of that era, just like the books of any era, are flaming piles of poo worth no one’s time. Some of the books of that era, just like the books of any era, are classics which deserve to be read in perpetuity. This is the latter. Flowers in the Storm is about a lot of things, but at the core is the knowledge that love is not a fleeting emotion, but a choice built on commitment and trust. The two characters, Maddy and Christian, are as different as people could be. Maddy – or Archamidea Timmes – is a devoted Quaker who encounters Christian – or the Duke of Jervlaux – though her father. Christian and Maddy’s dad write a paper that’s accepted as completely genius but Maddy is totally skeeved out by Christian. You see, he is the typical Regency hero – a rich douchecanoe who appears to have no concern for his fellow humans, especially women. But then, tragedy strikes. Christian has a stroke. He’s confined to a mental asylum (because evidently that’s what they did then and don’t get me started on how mad that makes me) without the power of speech and limited cognition. Maddy’s cousin runs the asylum and her good Quaker self starts to volunteer there. Over the course of three hundred or so pages, the two build a trust as they learn a way to communicate with each other that absolutely sucker punched me. I’m not doing any other plot details – Gossamer Obsessions has a fun one if you’re looking – because I’d rather talk about how this book made me feel. Let me reiterate. This book sucker punched me. In all the best ways. I think my favorite part was how she wrote the internal monologues in Christian’s head. I have never had a stroke so I can’t attest to the accuracy of his brain patterns, but man did she make them believable. The characters are vibrant and jumped right off the page. The process of him learning his own self again and then choosing to be the best version of that self was stunning. Maddy’s evolving relationship with her faith is also something to behold. There are no shortage of portrayals of religion as a constraining issue or as something that makes people awful humans. In this story, that’s done by Christian’s mother, who is convinced this disease is a punishment for his philandering. However, Kindle juxtaposes that with making Maddy’s faith a living and active entity within her that both determines and drives her and her relationship with Christian. How the internal journey happens is wonderful. In sum, this book is stunning. If you’ve never encountered this classic, I’d recommend catapulting it to the top of your TBR list. I enjoyed it with (several glasses) of whiskey – Bushmills Black Bush with two ice cubes and ginger ale. A sipping drink for a long burn of a novel. Evolution of the treatment of strokes: If you’re like me and you had no idea how people with strokes were treated throughout history, peruse this article from the American Heart Association. Asylums in Britain: A brief history of asylums in Britain – who went, for how long, for what. Eye opening indeed. Quakers in Britain: If the Quaker sect of Christianity is not one you’re familiar with but would like to be, start with their official website and learn more. I got this book from an Oxfam Books store in Belfast, Northern Ireland. If you live in the U.K., consider supporting the work of Oxfam by donating your used books to them and by shopping at their high street stores whenever possible.